Two-step verification interface has been introduced by Google for G Suite which is soon expected to be applied to other services within the next few weeks. The two-step verification introduced by Google has been made easier for the users, especially when the USB or Bluetooth security key is being used. "We’re updating how 2-Step Verification works for G Suite. This will make new 2-Step Verification methods available for some devices, and update the 2-Step Verification user interface on mobile and desktop devices. ", announced G Suite team in a blog post. Other models will also have the Bluetooth key support, Google announced. Before this, the Titan key was used by Google for 2-step verification in G Suite. A flag on Linux will manually be enabled by the administrator to enable this. Each browser will now have its own screen, as they all have their own distinctive designs. Previously these dialogs were shown by the service providers whereas now the browsers will be in charge of this, allowing different flows on different browsers, like Chrome, Safari, Edge, Firefox and others. This updated user interface will be available to users by default once it is fully rolled out. The 2-step verification will be available to Rapid Release Domain in a few stages that started from 26 March and will take two weeks to be completely available on all the domains. The company said the same procedure will be followed for the Scheduled Release Domains. 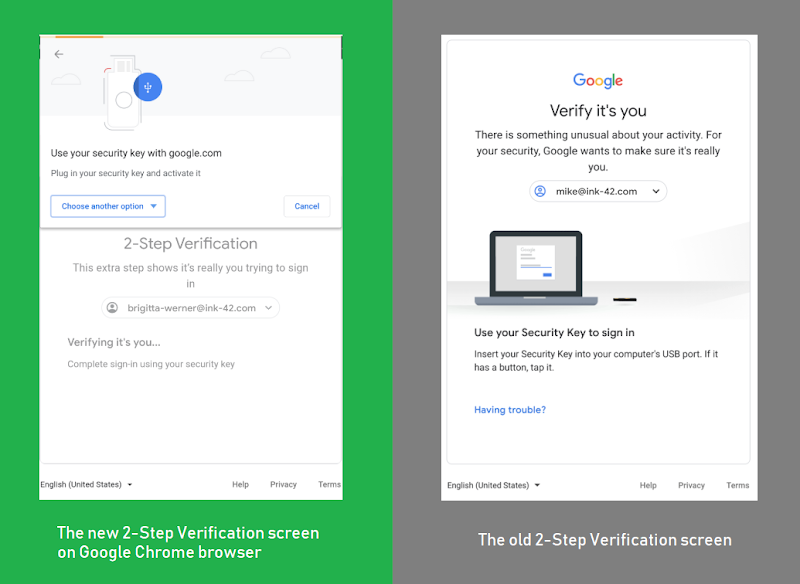 Google is hoping that this updated user interface for 2-step verification will not only easy to use but also make businesses and end users more secure than before, putting a barrier and stopping cybercriminals to get your data. This 2-step verification is a way to make your accounts more secure and protect from theft.